The Women’s Institute (W.I) in Sale has donated 83.20kgs of Food to Unit-E, the Wythenshawe food storage warehouse. The Women’s Institute was formed in 1915 and is the largest voluntary organisation for women in the UK. Members come from all ages and backgrounds and play a unique role in providing women with educational opportunities and a chance to build new skills, make new friends and take part in a wide variety of activities. The newly formed; The Willows W.I (Sale) held their first meeting in Jan 2018 and members generously donated items of non-perishable food to Unit-E.
‘Unit-E’ helps supply seven Food Banks within Wythenshawe and is supported by WCHG’s, Real Food team and a network of volunteers at the store in Wythenshawe Town Centre. 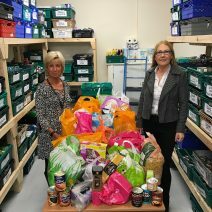 Unit-E utilises the Trussell Trust model with ‘The Food Poverty Group’ and works in collaboration with Fareshare, providing a more streamlined approach to supplying food banks in Wythenshawe through a bespoke referral system and data base. WCHG Group Chief Executive, Nigel Wilson said, “Thank you to the Women’s Institute Sale for their generous and kind donation. This will make a real difference to people’s lives in Wythenshawe”.